Since last few days, many people were guessing the upcoming Samsung GALAXY smartphone will be called as the Next GALAXY as that is what Samsung using everywhere for the promotion, specially after the launching of the GALAXY teaser videos.. 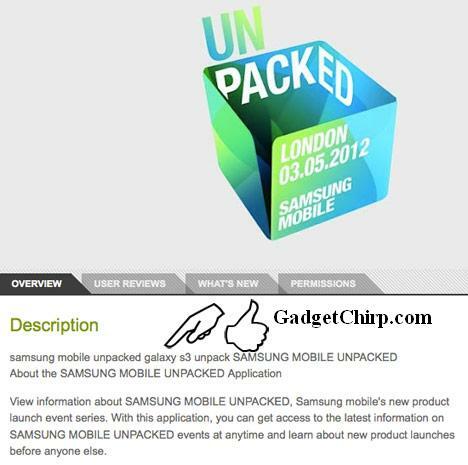 But with the launch of the Unpacked Event 2012 app, Samsung leaked that the hopefully the next GALAXY smartphone will be called the Samsung GALAXY S3. Samsung used the term GALAXY S3 in the keywords of the Unpacked 2012 app. Later this news started coming out then they just removed that keyword from the app description. Samsung Unpacked 2012 app covers and provide all the information regarding the Unpacked Event 2012 in which the next Samsung GALAXY smartphone is going to be launched on 3rd May, 2012. During the event, you can also watch the live stream of the event on your devices using the Unpacked 2012 app. You can download it from the link given below.